Saturday morning arrived very clear. That might mean wind later. I cooked abalone scrambled eggs for everyone. Eric's plan was a morning dive. Steve and Dale were going to do a deep mix dive. 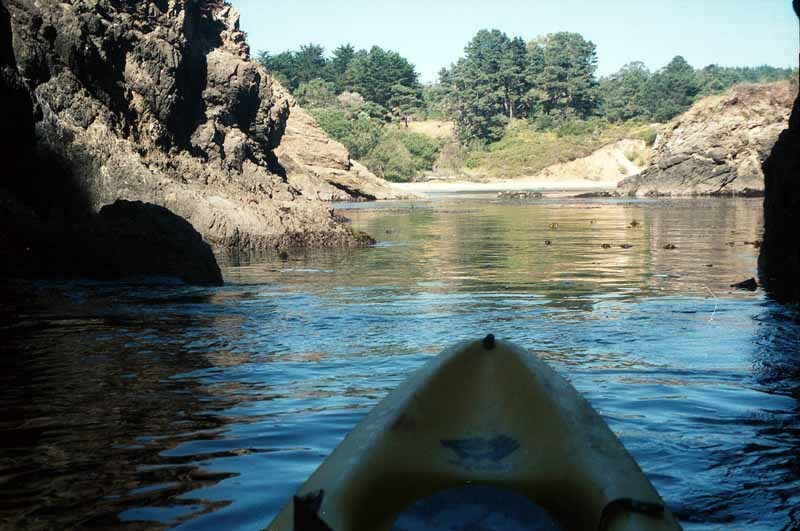 I wanted to finally go out in Van Damme Cove on a kayak. I had wanted to do this for years. Paddle out to the Keyhole and dive. Then go across to explore the caves and small coves on the north side of the cove. Dale had brought a couple kayaks and was happy to let me use one. Kevin was on his 2 person inflatable version. That one was nice. The Key Hole at the mouth of Van Damme Cove. The Keyhole is a hole going through one of the many rocks and reefs sticking up above and below the surface of the entire cove. These are the the sentinals that contest the border of land with the ceaseless assault of the sea. It was an easy ride with minimal wind as we paddled out to the Key Hole. We went through the keyhole itself and in and out of the many rocky channels there. The area is intoxicating. You go through the kelp and looking down you can see all kinds of life, including big abalone, just under the water. Kevin anchored and I tied off to his kayak. I was very carefully moving on my kayak so as not to lose gear or get my land camera wet. This is when Kevin told me to look over and there he was standing on his kayak. Amazing. Kevin riding the swell through the Key Hole. Mostly we dove on the other side of it. We entered the water and I wanted to look for a couple abalone to fill my limit. Where we were diving is normally the place of constant waves, but today was an unusual and temporary lull. The diving was amazing. Life was thick in the kelp with lots of fish and invertebrates. I tried to dive in one kelp area next to a rock, but it was just too thick. You're buried in kelp too thick to see anything. In the channel it was more open and there was good diving from the surface to 20 feet. I was making long free dives in whatever looked like a place that others might not have looked at. Sometimes, the best way to dive here is to swim right on the bottom looking up through the laminaria. That is when you will see the most of the shy colorful life that is hiding from view. Before long, I had two good fat abalone, both just about 9 inches. As much as I enjoy free diving for abalone, in a place like this free diving with a camera is almost as much fun and I was really hoping for some good pics. Unfortunately, I still had to use my abalone measure to activate the shutter. Kevin has found a fatty. I was having a great time. I took pictures of groups of abalone, then pictures of abalone with picnopodia, big green anemones, and even a couple nudibranchs. 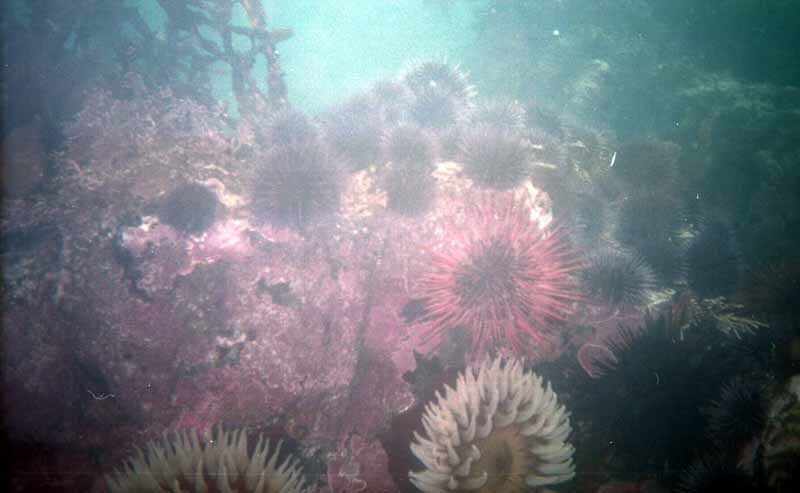 There were pisaster stars, bat stars, urchins and Rose Spotted Anemones. I also carefully took choreographed pictures of Kevin taking an abalone, a couple of times. There were so many species that I just worked to take pictures with two or more species in each shot. I repeatedly took pictures of a nice sized lingcod that sat and posed. After a number of shots of it, I decided I was going to try to take it after two more pictures, but it finally left.... It turned out later that the ASA was wrong and most of the pictures were over exposed. It's a poor picture, but it shows that thickness of the life on the rocks. Oh, and don't bump around carelessly. We had been there a long time and the wind was definitely coming up. This is a place of the ocean, of waves, seals and sea gulls. It is not a place that a person can visit for more than a short time. Perhaps that is some of it's beauty. Kevin was going to head straight to shore, but I started across the cove to look at the north side. I wanted to paddle fast so as not to prolong my contest with the wind. I went through channels between rocks covered with mussels and kelp palms. 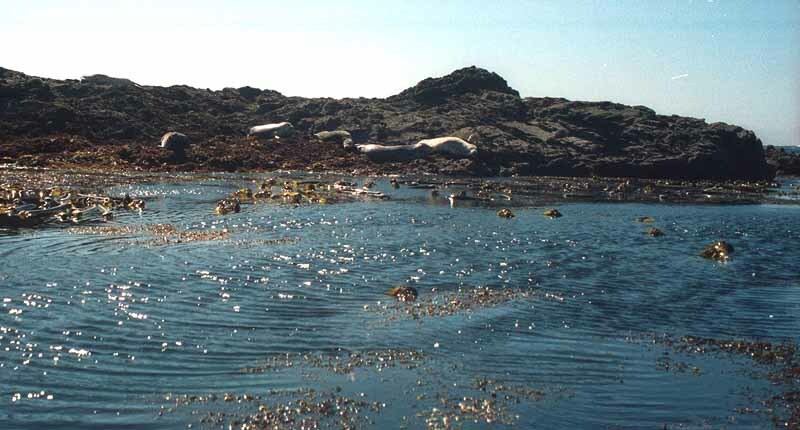 Seals and sea lions warily looked up from where they were napping on the rocks. Then I went for about 75 yards along the inside of the submerged part of the reef. These washrocks were probably covered by crashing waves most of the year. Then it was time to paddle against the wind across the open mouth of the cove. Under the cliffs on the north side of the cove it was glassy calm. I paddled past a wash rock with a couple of odd looking, red billed sea birds on it, probably Black Oyster Catchers.Here there were steep sided channels going deep into the cliffs. In many places there were tunnels. 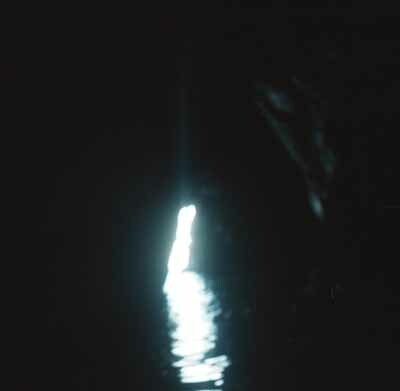 I went into one that was about 80 yards long before it opened into a small cove. Half way into the tunnel was a side tunnel that went to a tidal blowhole that was roaring and thumping as the small waves moved the water in it. Water dripping from the rocky ceiling of the tunnel made it damp and misty. Looking back. These are pretty substantial caves. As I came out it was sunny and other kayakers were relaxing in the calm protected waters. Near the rocks, the water was calm and it was easy to look under the surface at the life in the water. 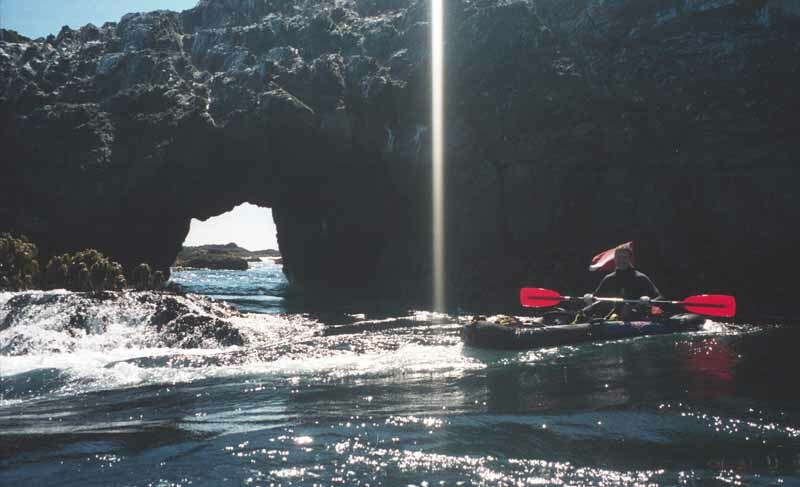 I saw groups of kayakers that were obviously a class and another group looking for abalone and another group hauled out of the water catching some sun in a very secluded covelet. There are many caves, channels and coves. 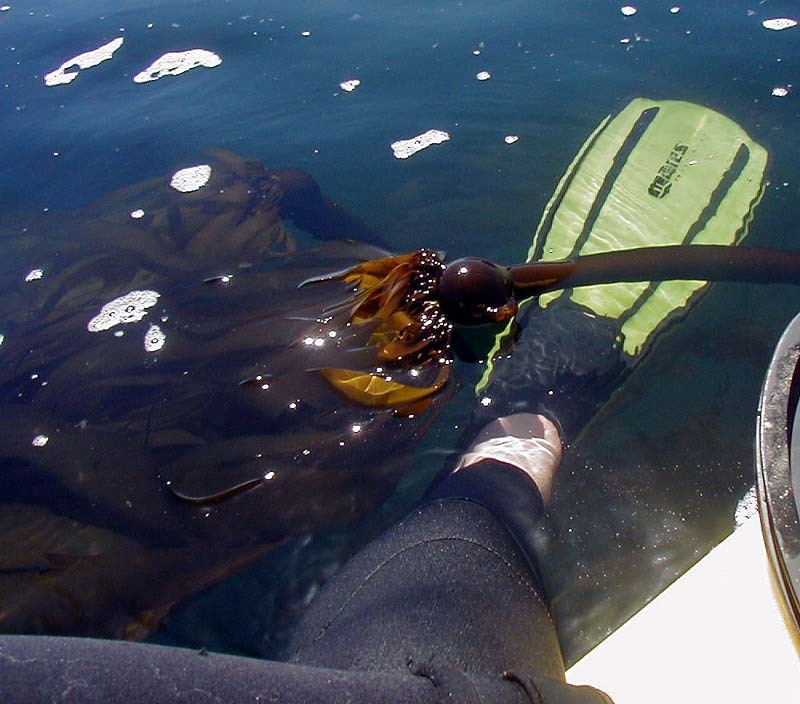 As I paddled along, there was a lot of macrocystis kelp. It was large, but old and deteriorating. 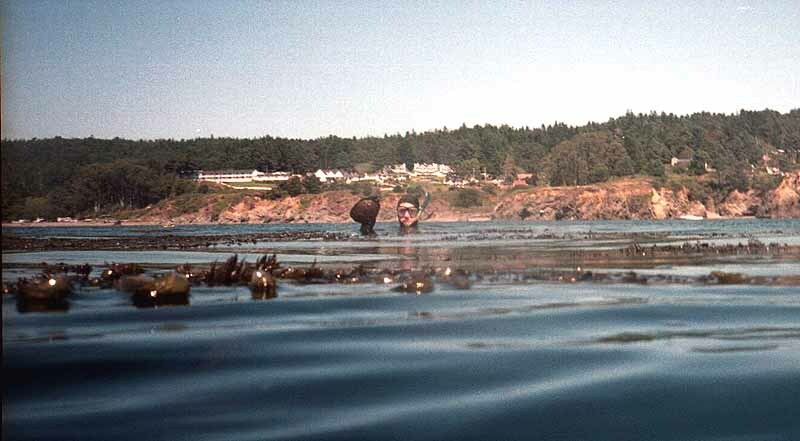 When I got to the last opening before the main cove, there were other kayakers paused in the thick kelp before heading to the beach. Perhaps they were just relaxing, but quite likely they were like me and didn't want to leave. Sometimes, plans are meant for not happening, especially plans involving the ocean. Eric and Steve had both had problems with their boats. Eric said that the dive was obviously not meant to be. It was late enough and time for a beer. Before long, people were starting the evening camp chores. We had another sumptuous meal and again, for some reason, we talked and watched the stars instead of sensibly passing out. I finally was reasonable and went to the quarter showers for about 5 dollers worth of hot water. The next morning, an early dive would have been possible, but the risks of the various problems with the different boats cancelled that. I packed my gear and looked longing around at the beautiful forested canyon I was in. These kayakers head out for exploration. I wish I were going with them. I headed south on hiway 1. I planned to go as far on that hiway as I had time for. I figured that I could at least drive as far as Bodega Bay where I had once spent so much time wandering and diving misty kelp lined shores. Perhaps I could even go as far as through Inverness and on to Stinson Beach. An extra day and I could have visited Point Reyes and Drakes Bay. Really, I was still there but I was very quickly leaving the beautiful diving of the North Coast behind. Now I was driving to where I came from. A place of the intensity and endless inspiration of my youth. As I traveled the beautiful hills and shores I tried to remember what it was like then, but most of that is all gone now like a movie without the sound. She's not here. Luckily, I still have the beauty and the diving I love. Perhaps I even have some of the wisdom the youthful inspirations led to. When I can return will not be soon enough.